SYNOPSIS - To the forest on the shore of the Kingdom of the Isles, the orphan called Pug came to study with the master magician Kulgan. But though his courage won him a place at court and the heart of a lovely Princess, he was ill at ease with the normal ways of wizardry. Yet Pug's strange sort of magic would one day change forever the fates of two world's. For dark beings from another world had opened a rift in the fabric of spacetime to begin again the age-old battle between the forces of Order and Chaos. EXCERPT - The room was silent as each person reflected on what had been seen. The boys watched and shared the feeling. It was as if no one were willing to speak, as if to do so would seal the priest's information forever in fact, while to stay silent might let it pass like a bad dream. Borric stood and paced over to the window. It looked out upon a blank rear wall of the castle, but he stared as if seeking something there, something that would provide an answer for the questions that spun in his mind. He turned quickly and said, "How did they get here, Tully?" FL Speaks - Scintillating stuff to a new saga. I do not know why i waited till today to read this book, knowing it was first published 29 years ago. This is what fantasy is all about. Sorcerers, swordmasters, elves, dwarves, dragons, goblins. You name it, this book has it and much much more. This book is an excellent, and i mean excellent guide to people who would want to venture into the world of high fantasy. Written in extremely simple narration, the book starts from page 1 and just continues like a flowing river until the mid-way, where eventually it forks out to different branches. Pug, the main character is an orphan boy living in Crydee. He becomes an apprentice to master magician Kulgan on the day of their choosing. Pug and Tomas, who is his closest friend and almost-brother, chance upon a shipwreck one night and are suddenly attacked by warriors they have never seen the likes before. Later, they are told that these warriors came through a rift in the time fabric and belonged to a different world. Some of the most funniest moments are the ones in which Tomas and Pug are together. Those two together made me laugh so hard that i fell down from bed holding my stomach. The innocence of first love, the awkwardness of being in love with a member of the royal family and then trying to decipher her mixed signals is absolutely hilarious. As the danger looms over their heads, Pug and Tomas along with the Duke and few others make the long journey to the king to prepare for reinforcements. In the way, they get attacked and separated. Hope comes to them in the form of dwarves and elves and despair, in the form of death of loved ones. This is one must-read series. Just because of the simplicity of the words and wonder at the characters. 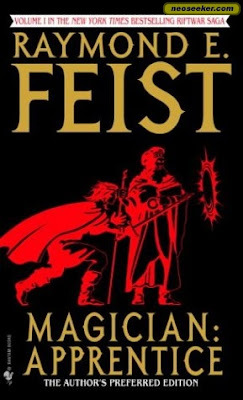 Raymond E. Feist spins a tale straight out of air and we are left gasping for more.